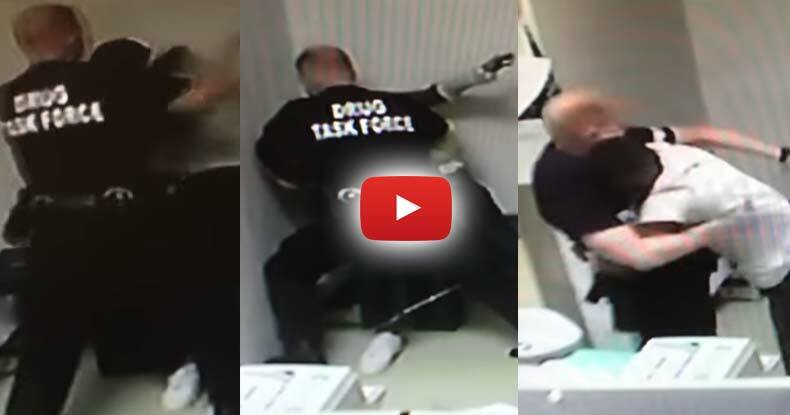 Allegheny County, PA — A disturbing video was released this week showing an altercation between a police officer and a 21-year-old man arrested on suspicion of heroin possession. The video shows an attack by the officer and subsequent defense by the 21-year-old. While the incident happened in 2015, Todd Hollis, the attorney for the 21-year-old suspect, Joshua Brooks, waited to release the video and file the lawsuit until after the criminal charges against Brooks were resolved. On April 17, 2015, Brooks was arrested on charges of suspicion of heroin possession. He was brought into the custody of the Elizabeth Borough police department and chained to a bench. As the altercation begins, Brooks is seen standing up when officer Garrett Kimmell approaches and tries to grab Brooks’ throat. Not wanting to be choked or have his trachea crushed, Brooks attempted to push Kimmell’s hands away. Pushing away Kimmell’s hands caused the officer to begin punching Brooks. As the punches start to fly at his face, Brooks begins to fight back in an act of defense. However, it appears that he quickly realized that the fight is futile, since he was chained to a bench in a police station, and so he raised his hands and submitted. Brooks’ submission, however, did not stop Kimmell’s attack. For several moments Kimmell appears to continue to choke the non-violent man. For over a minute, Brooks remains submissive as this cop continues to attack him. But after having enough abuse, Brooks wrapped his arms around the cop’s body in an attempt to stop the attack. The two go back and forth before another officer enters the room and helps to subdue Brooks so Kimmell can then fire his taser. The video then ends. “The acts that happened on that particular day don’t denote honor, and I think it brings dishonor to all the great police officers in our city and the country,” Hollis said. According to the lawsuit now filed on Brooks’ behalf against the department, after this incident, additional charges of resisting arrest and aggravated assault on an officer were filed against Brooks. However, according to Hollis, after the Allegheny County District Attorney’s Office saw the surveillance video, the charges were dropped. The lawsuit filed Wednesday accuses Kimmell of excessive force and accuses the second officer of failure to intervene, according to WPXI. “Sometimes, what you do in the dark comes to light, and I think this is one of those instances,” Hollis said. What do you think? Does the video below show self-defense?